Our 200 current nest box holders have been sent certificates with their given nest box number and can track the progress through our annual monitoring of the boxes on the Project Possum webpage. Adoption of a nest box includes a one year membership for you or your organisation to keep you up to date with meeting invitations, field and training opportunities, and group efforts in general. 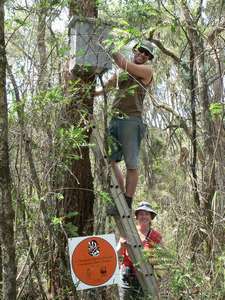 As a member you are welcome to become involved in Project Possum and receive training to enable you to assist with volunteer fieldwork such as nest box installations, monitoring and maybe even view your box – hopefully with a colony of LBPs living inside!